Which charger to choose for my needs? Here is what I am looking for. I would like a charger that will charge my 18650 batteries in a Nitecore Intellicharger i4. If it could also charge other items, that would be awesome. I am very interested in purchasing, and any information you can provide would be very helpful! Re: Which charger to choose for my needs? 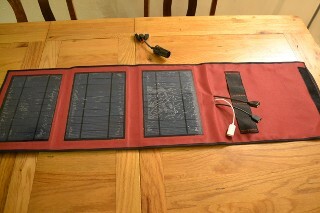 Do you mean Solar Charger? (I assume you do) I think the Nicecore is 12v, so normally recommend a tri-fold 1.1amp folder. This will put out 1.1amps at 15V via a car cigar socket which should power the nitecore fine (you can check what the plug supplies) It would also give you 3 x usb ports (one apple compatible) for charging power stores and phones etc. I include a combiner to put out 3.3amp from a single port for occasions the sun doesn't shine. It will come with a cheap nimh charger and a basic but sound li-ion charger set to 700ma. I can make these to order in any colour: (Red, Blue, Black) and any trim ( red, blue black yellow) and post around 2 weeks after ordering. These are $169 including worldwide shipping. If you want to make some adjustments to what is made/sent I can often do that. Folks often like the power stores ($15) to store up energy when the sun is out to use later in case that also interests you. 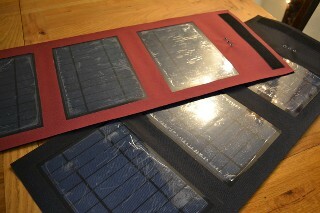 Yes, I was talking about a solar charger I would like to be able to charge 18650's, as well as down to aa, AAA sized batteries. With your included charger, is that possible? Do you have any pictures of this setup your mentioning?